This tree is quite eye-catching with its beautiful bright red flower heads. From personal experience it really 'took our eye' when we first moved to the Coffs Coast when we saw it in flower (I even took photos so it could be identified!). Originating from northern Argentina, eastern Brazil, Bolivia, Paraguay and Uruguay the Coral tree was originally sold as a fast growing, beautiful ornamental tree. 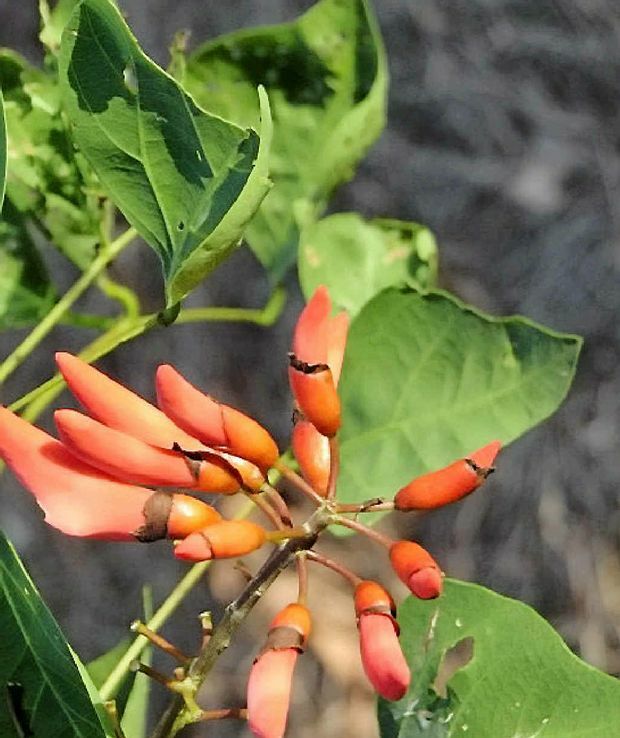 Coral trees have become an invasive pest plant in native bushland areas. It has a broadly spreading habit and will grow up to 6m or more tall. Its stems are sparsely covered in sharp thorns and the leaves are divided into three elongated leaflets. The flowers which appear before the leaves in spring, are scarlet red to dark red pea-shaped and are borne in large elongated clusters at the tips of the branches. The seed pods are also elongated, dark brown and are slightly constricted between each of the shiny mottled seeds. The common coral tree has been spread from garden and street plantings and become an environmental weed in the coastal regions of NSW including the Coffs Coast. It has also recently become naturalised in south-eastern Queensland, and is a potential or emerging environmental weed in that region. Coral trees can be spread by seed (except for the hybrid Erythrina x sykesii) and propagates freely vegetatively, via stem segments and suckers. The branches are very brittle and break easily so logs, branches, and even twigs will grow into new plants. 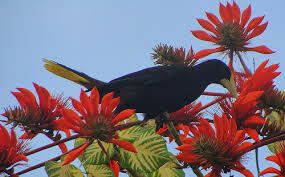 However, it has to be said that the spread of the common coral tree is often aided by the dumping of garden waste in bushland areas. It is primarily a problem along creeks and rivers, but will also grow in disturbed natural vegetation and open woodlands. If you travel further north from the Coffs Coast, keep an eye out (especially when it is in flower) and you will see many trees growing in the Byron hinterland, where it has become a very serious problem. Eradication? Small plants may be pulled by hand however take care to remove all roots before bagging and disposing. Stem inject larger plants with 100% glyphosate by using the drill method rather than hatchet as the stem has a very high water content. Because stems re-grow so readily when in contact with the soil, Coral trees are very difficult to control, so it is paramount that all plant material is removed from the site. Use protective clothing and gloves when dealing with this tree as the thorns can cause injury, which can then become infected. For something that is just so pleasing to the eye it sure packs a punch!